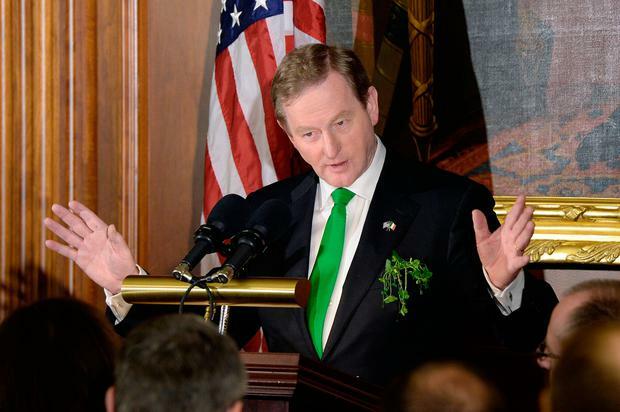 America gets Enda Kenny. They love jokes like the one about the man in Cork who gave out to him for "blocking up Irish roads with people going to work". Whereas we cringe that the idea of phrases like "this one is for you, baby", they burst into uncontrollable laughter. And when he talks, they see an "extraordinary" and "exceptional" leader who has made Ireland great again. But Donald Trump wasn't supposed to be just another American who'd fall for a bit of St Patrick's Day paddywhackery. Entering his Oval Office is a high-stakes game that can end with international embarrassment. Neither of Mr Kenny's likely successors wanted this trip to Washington, but he did. For whatever reason, the Taoiseach felt he needed one more day of being whizzed around the US capital by the Secret Service. So, no doubt, he has thought carefully about how to approach Mr Trump, what words to use and how hard to push him on the issues that matter like immigration. The night before his White House visit, Mr Kenny sat at the Ireland Funds dinner, where George Mitchell gave an awe-inspiring speech. The Taoiseach acknowledged privately afterwards that it was the perfect tone for such an event and for dealing with the new Washington order. Mr Mitchell said that every rational American knew the country could not return to days of open immigration - but "from the very beginning our country has been enriched by new ideas and new people". "The strength of America lies in our ideals. They're not easily summarised, but surely include individual liberty, opportunity for all, an independent judiciary and commitment to those ideals." Addressing Vice-President Mike Pence, who was also honoured at the event, he said: "Commitment to these ideals makes us Americans, not ideals, race or religion. Mr Pence, you carry with us the best wishes of living up to these requirements." Without ever raising his voice or using provocative language, Mr Mitchell managed to achieve a lengthy standing ovation. As they might say in the US, it was a 'schooling' for the Taoiseach. Mr Kenny has not had the easiest run up to his White House visit. The leadership question hangs over him like a guillotine's blade. His previous comments about Mr Trump's language being "racist and dangerous" resurfaced. And there was the fact his meeting came on the same day as the president's latest travel ban on six predominantly Muslim countries was due to come into effect. But yesterday he followed Mr Mitchell's lead. The Taoiseach led with courtesy and good cheer, luring the new American president into believing he's "a great guy". At first, it looked fawning and it was. Mr Kenny's praise for how Mr Trump "beat them all, no matter what they say" will have made a large portion of the Irish population sink behind their sofas. But in the full view of the most senior Republicans and Democrats on Capitol Hill it drew genuine laughter. There were the usual jokes about the president packing his golf clubs into Air Force One for a trip to Ireland. And Mr Kenny presented the vice-president with a hurley. At this stage, we could probably make a Junior B team out of the US politicians that have been given hurleys by the Taoiseach. As he eased into the day, Mr Kenny took a risk in mocking Mr Trump's ability to read from a script but the president lapped it up, clapping along with everyone else. The president decided to play along. "Tee-shock, that's my new friend, my new friend," he declared. Earlier in the week, Mr Kenny had promised the travelling media he'd give a full debrief on his private talks with Mr Trump. Outside the West Wing, Mr Kenny gave a press conference where he divulged they talked about immigration, the European Union and the pharmaceutical industry. It was far from inspiring. He hadn't pulled the president up on his racist language or insisted that illegal Irish immigrants should get a special deal. The headlines were already half-written about how Mr Kenny 'bowed at the altar of Trump'. But then back on the Hill, the Taoiseach went off script as he concluded his remarks. He turned sideways on the podium to address Mr Trump directly, saying Irish immigrants "fought every war for America and died for America, and will continue to do so. All they want is the opportunity to be free". He pointed out how the American national anthem talks about the land of the free and home the brave. "Our people are as brave as ever but maybe not as free," he said. And he even quoted George Mitchell from the night before. There was heavy applause. Nancy Pelosi, the Democrats' Minority Leader of the House of Representatives, was almost bouncing in her seat with delight at the Taoiseach's words. "We would like this to be sorted," Mr Kenny said with a fist pump, adding that millions of undocumented immigrants of all nations would help make America great. Within that room, there were two very distinct audiences but the Taoiseach managed to flatter both sides and still get a firmer than usual message across. His problem may be that on the outside there are also two audiences. Those who believe he may have helped inform Mr Trump's future decisions on immigration, and those who believe he should never have gone near a racist bigot in the first place. It's a case of not being able to please everybody, but the Taoiseach will probably be pleased with himself.